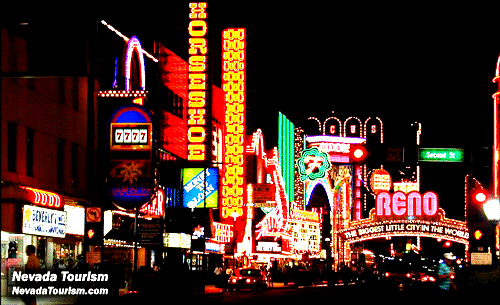 NEVADA ATTRACTIONS! STATE OF NEVADA ATTRACTIONS! 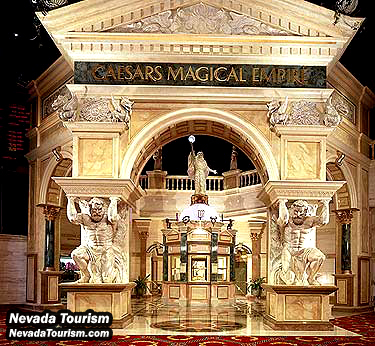 NEVADA HOTELS, CASINOS, SHOW TICKETS, ENTERTAINMENT! Nevada State Attractions! Carson City, Lake Tahoe, Las Vegas, and Reno, Nevada! 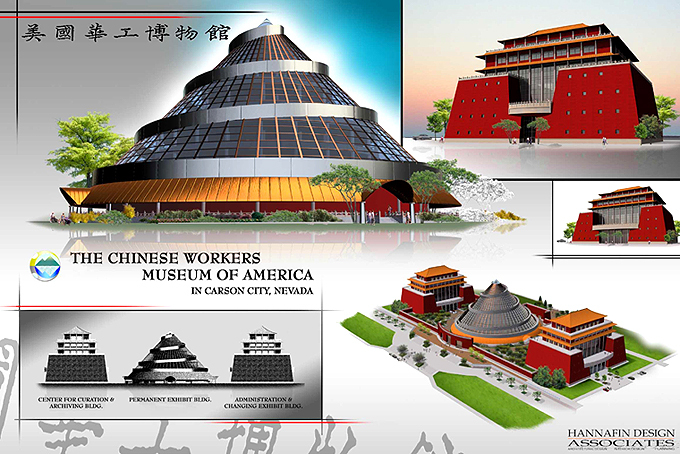 - Showcases international educational and cultural events to contribute to greater American-Chinese understanding. 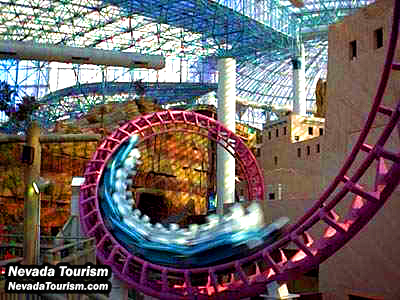 Theme park at Circus Circus contained within a climate-controlled pink glass dome featuring thrill rides for all ages plus dinosaurs and other attractions. 2880 Las Vegas Blvd. S., Las Vegas 89109. Hours: Opens at 10:00 a.m. daily. Season: Year-round. The Atomic Testing Museum opened in Las Vegas with intriguing exhibits that chronicle the history of U.S. nuclear weapons tests. Exhibits include a simulated atmospheric blast that flashes and rumbles through the “Ground Zero Theater” and gives the audience the sensation of witnessing an actual test. The museum is at 755 East Flamingo Road and Swenson Street east of the Las Vegas Strip in the Frank H. Rogers Science & Technology Building shared with the Desert Research Institute of the University of Nevada Las Vegas. It is open Monday through Saturday from 9 a.m. to 5 p.m. and Sundays from 1 to 5 p.m.
Mystery, dining and reality-defying magical illusions are yours to explore in awe-inspiring surroundings. 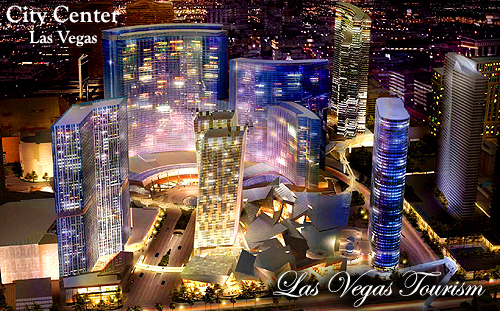 Information: 3570 Las Vegas Blvd. S., Las Vegas 89109. Hours: 4:30 p.m.-9:30 p.m, Tue.-Sat. Season: Year-round. See 35 years of Shelby performance cars and the company's new manufacturing facility for Shelby Cobras and the new Series 1. 6755 Speedway Dr., Las Vegas, NV. 89115. Hours: 8:00 a.m.-5:00 p.m., Mon.-Fri. Season: Year-round except major holidays. Admission: Free. Three-dimensional motion simulator ride with six different exciting action-packed films. 3500 Las Vegas Blvd. S., Suite J1, Las Vegas 89109. Hours: 10:00 a.m.-11:00 p.m., Sun.-Thu. ; 10:00 a.m.-midnight, Fri.-Sat. Season: Year-round. Red Rock Canyon riding stable offers professionally guided horseback riding, mustang viewing, campfire music and cowboy poetry. 1211 S. Eastern Ave., Las Vegas 89104. Hours: 8:00 a.m.-dark., daily. Season: Year-round. Year-round changing exhibitions in all media featuring invited national and regional artists, faculty and students. 4505 S. Maryland Pkwy., Las Vegas 89154-5002. Hours: 9:00 a.m.-5:00 p.m., Mon.-Fri.; 10:00 a.m.-2:00 p.m. Sat. Season: Year-round. Admission: Free. 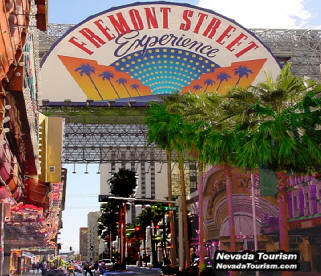 An exciting pedestrian promenade located in the neon center of downtown Las Vegas. One-of-a-kind light and sound show derived from over two million lights and 540,000 watts of concert-quality sound. 425 Fremont Street, Las Vegas 89101. Hours: Dusk to 11:00 p.m. nightly. Midnight shows on Fri. and Sat. Season: Year-round. Admission: None. Stephen Spielberg's entertainment destination featuring a full-service bar and grill, rock climbing and interactive game floor. 3785 Las Vegas Blvd. S., Las Vegas 89109. Hours: 10:00 a.m.-midnight daily. Season: Year-round. Admission: Free. See the amazing facts and feats of the Guinness Book of Records brought to life via replicas, videos and hands-on displays. 2780 Las Vegas Blvd. S., Las Vegas 89019. Hours: 9:00 a.m.-6:00 p.m., daily. Season: Year-round. A climbing school and guide service offering all levels of rock climbing instruction and guided climbs in Red Rock. 8221 W. Charleston, Ste 106, Las Vegas 89117. Hours: Anytime, daily. Season: Year-round. 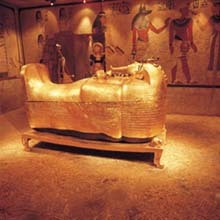 A replica of King Tut's Tomb as found by archeologist Howard Carter in 1922, located on the Luxor's Attractions Level. 3900 Las Vegas Blvd. S., Las Vegas 89119-1000. Hours: 9:00 a.m.-11:00 p.m., Sun.-Thu. ; 9:00 a.m.-11:30 p.m., Fri.-Sat. Season: Year-round. Entry Fee Applies. A non-profit institution housed in a new $20-million library facility, the museum exhibits international, national and regional art. 9600 W. Sahara Ave., Las Vegas 89117. Hours: 10:00 a.m.-5:00 p.m., Tue.-Sat. ; 1:00 p.m.-5:00 p.m., Sun. Season: Year-round. Marine life, Nevada's wildlife, Africa savannah/Africa rain forest room and animated dinosaurs are featured, plus children's hands-on room. 900 Las Vegas Blvd. N., Las Vegas 89101. Hours: 9:00 a.m.-4:00 p.m., daily. Season: Year-round. Over 100 hands-on exhibits in the arts, humanities and sciences plus traveling displays, programs & entertainment. 833 Las Vegas Blvd. N., Las Vegas. Hours: 10:00 a.m.-5:00 p.m., Tue.-Sun. Season: Year-round. Fun, colorful retail store plus the 3-D adventure movie with "Red" and "Yellow". 3785 Las Vegas Blvd. S., Las Vegas 89193. Hours: 10:00 a.m.-midnight., Sun.-Thu. ; 10:00 a.m.-1:00 a.m., Fri.-Sat. Season: Year-round except Christmas. Exceptional showcase of more than 100 exquisite wax figures of famous celebrities; combines legendary and contemporary stars from the world of film, sports and entertainment. 3355 Las Vegas Blvd. S., Las Vegas 89030. Hours: 10:00 a.m.-10:00 p.m., daily. Season: Year-round. Explore $4.5 million collection of magic, movie and ventriloquist memorabilia. Experience the history of magic firsthand and see a live comedy magic show in the "Comedy Magic Theatre". 3555 Las Vegas Blvd. S., Las Vegas 89109. Hours: Season: Year-round. Exhibits of archeology, anthropology and natural history of the Southwest and Central America plus traveling exhibit gallery. 4505 S. Maryland Pkwy., Las Vegas 89154-4012. Hours: 8:00 a.m.-4:45 p.m., Mon.-Fri.; 10:00 a.m.-2:00 p.m., Sat. Season: Year-round. Admission: Free. 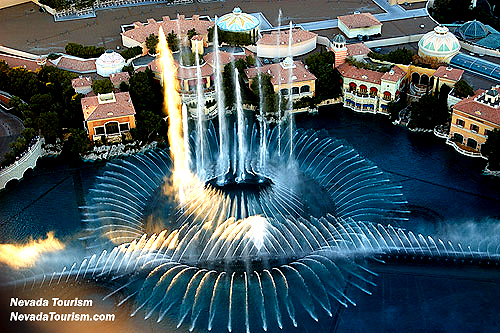 The new $25 Million Dollar Mirage volcano, designed by the same company which developed the Fountains of the Bellagio newly opened on December 8, 2008! The new Mirage volcano erupts every hour with a 4 1/2 minute free show, featuring water shooting 120 feet above the Volcano with 120 fireballs thrown into the air, choreographed to a new musical score. The technology being used allows the Mirage volcano to be more realistic in both more appearance and island setting. Steam pours from the sides of the volcano, water flows down crevices on the sides of the mountain, and fire and flames sprout from numerous openings. 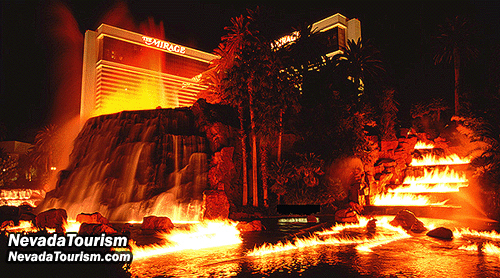 The largest volcano fire eruption during the show, shoots 60 feet above the Las Vegas Strip!. The museum depicts Southern Nevada's plants, animals, fossils and history from the Ice Age to modern times. 700 Twin Lakes Dr., Las Vegas 89107. Hours: 9:00 a.m.-5:00 p.m., daily except major holidays. Season: Year-round. Built in 1855, the fort is the oldest European-American building in Nevada and the site of the first settlement of Las Vegas. 500 E. Washington, Las Vegas 89101. Hours: 8:30 a.m.-3:30 p.m., daily. Season: Year-round except major holidays. Giant-screen IMAX 3-D motion simulator thrill ride offering a multi-sensory experience of a rider in a chariot race through legendary Atlantis. 3500 Las Vegas Blvd. S., Suite N26, Las Vegas. Hours: 10:00 a.m.-11:00 p.m., Sun.-Thu. ; 10:00 a.m.-midnight, Fri.-Sat. Season: Year-round. Rebel Adventure Tours are action, fun, and fact-filled. Eleven passenger Hummers, jet skis, whitewater rafting, helicopters, sailplains, ATV's, covered wagons and horses. 713 E. Ogden Street, Ste D, Las Vegas 89101. Season: Year-round. Scheduled group and individual tours. 8665 W. Flamingo Road Rd. #131-214, Las Vegas 89117. Hours: 10:00 a.m.-5:00 p.m. daily. Season: Year-round. Home to six rare animal breeds, including the white lions of Timbavati and Siegfried & Roy's royal white tigers. Designed to increase public awareness of all endangered animals. 3400 Las Vegas Blvd. S., Las Vegas 89109. Season: Year-round. Be transported to the Enterprise bridge, plunge down a turbolift and brave a shuttlecraft mission though space and time; also enjoy dining, shopping and gaming during your visit to the 24th century. 3000 Paradise Rd., Las Vegas 89109. Hours: 11:00 a.m.-11:00 p.m., daily. Season: Year-round. World's largest and finest classic collectors car show. Featuring over 300 automobiles for sale. 3535 Las Vegas Blvd. S. Las Vegas 89109. Hours: 9:30 a.m.-11:30 p.m., daily. Season: Year-round. The Bellagio Water Show features an outdoor music and light show with a dancing waterfall.l Each show is unique. 3600 Las Vegas Blvd. So., Las Vegas 89109. Hours: Weekdays every half hour 3:00 p.m.-8:00 p.m.; every 15 minutes thereafter until midnight. The shows begin at noon on the weekends and holidays. Season: Year-round. Admission: Free. A King's ransom in rare coins and currency, treasures of gold and silver, and a $2 million nickel are included in exhibits. 3950 Las Vegas Blvd. S., Las Vegas 89119. Hours: 9:00 a.m.-midnight, daily. Season: Year-round. Hot-air balloon rides, weddings, hotel pick-up. 6050 or 2013 Clover Path, Las Vegas 89128. Hours: 7:00 a.m.-7:00 p.m. daily. Season: Year-round. Exhibits of endangered cats, the last family of Barbary Apes, chimpanzees, eagles, ostriches, emus, parrots, wallabies, flamingos, exotic and venomous reptiles. 1775 N. Rancho Dr., Las Vegas. Hours: 9:00 a.m.-5:00 p.m., daily. Season: Year-round. The Tahoe Boat is completely restored with state-of-the-art electronics, and 500 HP. The Tahoe is available for charter. Information: (775) 588-1855 or (888) 867-6394; Fax: (775) 588-7391 or P.O. Box 1375, Hwy. 50 at Zephyr Cove 89448. Hours: 9:00 a.m.-7:00 p.m. daily. Season: Apr.-Oct. Admission: $Call. 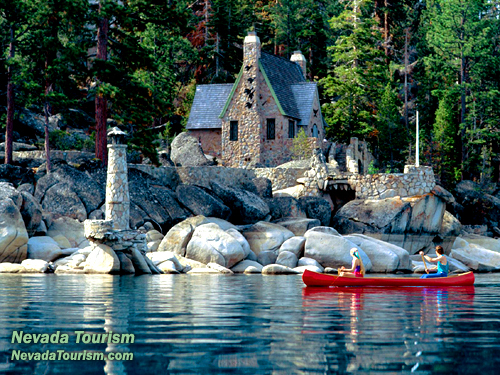 Offers public and private sailing excursions plus weddings for up to 50 passengers from Zephyr Cove and Camp Richardson. U.S. Hwy. 50 at Zephyr Cove, P.O. Box 1375, Zephyr Cove 89448. Hours: 9:00 a.m.-7:00 p.m., daily. Season: Apr.-Oct. Complete lakeside resort with sandy beach, boat rentals, jet skiing, parasailing, stables, cabins, campground, sailing, sport fishing and more. 760 U.S. Hwy. 50, P.O. Box 830, Zephyr Cove 89448. Hours: 24 hours, daily. Season: Year-round. Exhilarating snowmobile rides with spectacular lake views from 9,000 feet; guides, instruction and helmets included - special clothing is available. First-timers and groups welcome. Free shuttle service from Stateline Casinos also available. 830, Zephyr Cove 89448. Hours: 9:00 a.m.-6:00 p.m., daily. Season: Nov.-Apr. The museum features the Mackay silver collection, mining artifacts and a large exhibit of rocks, minerals and fossils. University of Nevada, Reno, Mackay School of Mines, Reno 89557. Hours: 8:00 a.m.-4:00 p.m., Mon.-Fri. Sep.-May; 7:30 a.m.-3:30 p.m. Jun.-Aug. Season: Year-round except major holidays and school breaks. Admission: Free. Ten acres with 22 diverse theme gardens including a donor's tree grove, xeriscape garden and songbird garden. 1502 Washington St., Reno 89503. Hours: Sunrise-sunset, daily. Season: Year-round. Admission: None; nominal fee for guided tours. A children's park with farm animals, dinosaurs, Discovery Room, log flume, pony rides and an underground mine. 1502 Washington St., Reno 89503. Hours: 10:00 a.m.-5:00 p.m., Tue.-Sat. ; Noon-5:00 p.m. Sun. Season: Memorial Day through Labor Day. Museum houses the lifetime collections of the late Wilbur May, department store magnate, rancher, big-game hunter, businessman and philanthropist who traveled around the world 40 times. Also family-oriented changing exhibits. 1502 Washington St., Reno 89503. Hours: Seasonal. Season: Year-round. Nevada's first planetarium features star shows, SkyDome films, free museum and public observatory. 1664 N. Virginia St., Reno 89557. Hours: 8:00 a.m.-8:00 p.m., Mon.-Fri.; 11:00 a.m.-8:00 p.m. Sat.-Sun. Season: Year-round except major holidays. Three very fast world-class go-cart tracks. 2500 E. Second St., Reno 89595. Hours: noon-11:00 p.m., daily. The National Automobile Museum (The Harrah Collection) has a “Wow!” factor you don’t often find in a museum. You’ll see more than 200 eye-popping cars, and four authentic street scenes representing each quarter of the 20th century. The facades bring displays to life; a department store here, a movie theatre there which accompany artifacts from each era. Audio tours let you explore the museum at your own pace. It’s located on the corner of Lake and Mill Streets in downtown Reno. Call (775) 333-9300 or visit www.automuseum.org. 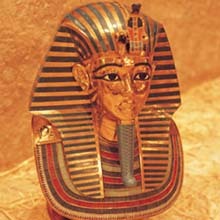 The museum is open Mon. – Sat. from 9:30 a.m. to 5:30 p.m. and Sun. from 10 a.m. to 4 p.m.
Arena-type facility designed for tournaments and special events. Includes shops, a restaurant and Iwerks Theatre featuring adventure films. 300 N. Center St., Reno 89501. Hours: 8:00 a.m.-5:00 p.m., daily. Season: Year-round. Founded in 1904, the state's oldest museum offers permanent exhibits that encompass prehistoric times to the present. 1650 N. Virginia St., Reno 89503. Hours: Museum: 10:00 a.m.-5:00 p.m., Mon.-Sat. ; Library: Noon-4:00 p.m., Tue.-Sat. Season: Year-round, except major holidays. Visit Nevada's premier fine arts museum and enjoy world-class exhibitions ranging from contemporary to historic perspectives. 160 W. Liberty St., Reno 89501. Hours: 10:00 a.m.-4:00 p.m., Tue., Wed. and Fri.; 10:00 a.m.-7:00 p.m., Thur. ; noon-4:00 p.m., Sat.-Sun. Season: Year-round. Twelve exhibitions per year from regional and national artists displaying diverse mediums in contemporary visual art. University of Nevada, Reno, Department of Art #224, Reno 89557. Hours: 8:00 a.m.-5:00 p.m. Mon., Wed., Fri.; 8:00 a.m.-6:00 p.m. Tue., Thu. Season: Year-round. Admission: None. Offers a unique experience with an opportunity to get close to many animals; includes over 200 animals representing 40 species. 10200 N. Virginia St., Reno 89506. Hours: 10:00 a.m.-5:00 p.m., daily. Season: Apr.-Oct. Combine sky diving, bungee jumping and hang-gliding from a 180-foot tower for the thrill of your life. 2500 E. Second St., Reno 89595. Hours: Noon-11:00 p.m., daily. Season: Year-round. 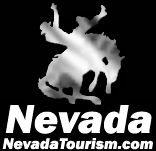 Nevada Attractions, Nevada Tours, including nevada, attractions, tours, hotels, casinos, attraction, tour, attractions and tours, official site, shows, show tickets, and Nevada entertainment.